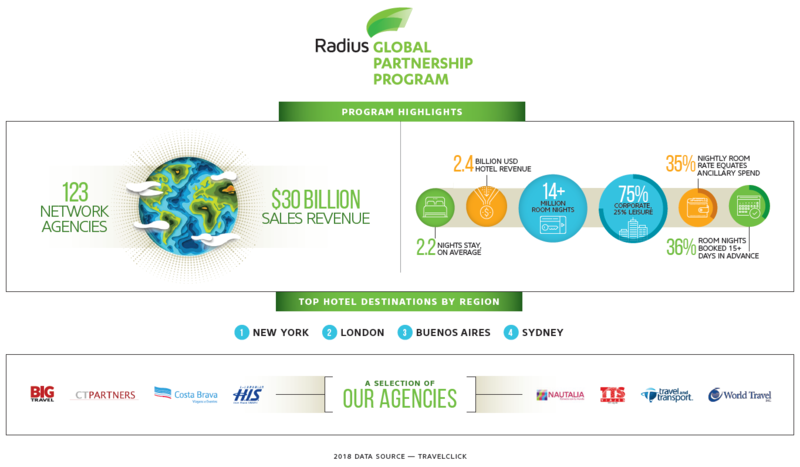 The Radius Travel network manages $30 billion in business travel each year, from eight-figure corporate accounts to specialized SME programs. That’s something we take pride in – and for our preferred partnerships, it often means a higher return on your investment per booking in comparison to other TMCs. As a partner, you get access to high-spending travelers across the spectrum, and the opportunity to establish preferred relationships with our multinational corporate accounts. Due to the unique nature of our network, we are also able to distribute your product to our rigorously vetted local TMCs who have the knowledge and experience in their own markets. You don’t have to be a hotel to become a Radius Travel partner. We also have close relationships with airlines, rail sellers, car hire providers, and travel tech companies. We are a highly desirable partner to our current partners because of our network – we have 100+ best in class agencies around the world. If you see the value in our network and think you can bring value to it in return, we’re interested in talking to you.